Unless youâ€™ve been living under a Pop Rock, youâ€™ve heard the pop tunes of Katy Perry — maybe on your radio or maybe your kids have been singing about â€œCalifornia Gurlsâ€ or â€œE.T.â€ On the cover of the latest issue of Rolling Stone, Katy Perry has donned a Hersheyâ€™s Kiss bra. 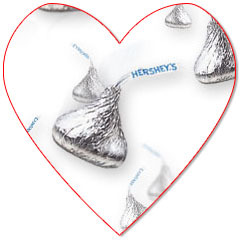 Iâ€™m sure there are some folks in Pennsylvania thanking the artist for putting their chocolaty treats on the minds of tweenyboppers all over the planet. This guest review was written by Laura Kaspick…. 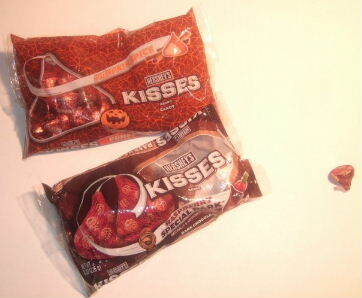 Back in December 2007, Candy Addict reviewed the Chocolate Marshmallow Hershey Kisses. While the reviewer had hoped that these were going to have a marshmallow fondant center, she was disappointed to find that the Kisses were actually just solid marshmallow flavored chocolate. A solid Kiss is certainly less interesting than a filled one, but I was still intrigued and hoped to track down the limited edition offering. Unfortunately, months passed without any luck and I was certain I had missed my chance. Imagine my excitement when half a year later I finally spotted the elusive Chocolate Marshmallow Hershey Kiss! There they were in the candy aisle of Walgreens, with the same poofy marshmallows and chocolate sauce on the packaging and the same silver and brown checkerboard patterned foil wrappers that the Chocolate Marshmallow had. 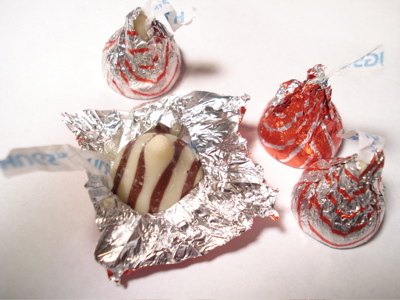 But after a closer look, I realized that there was something much different about these marshmallow Hershey Kisses. 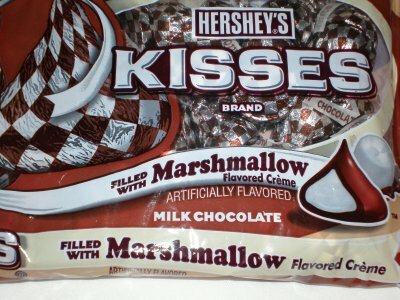 These were not the same product that had escaped me for so long – instead, these were Hershey Kisses “filled with marshmallow flavored crÃ¨me”! While this confirmed that I had indeed failed to find the December marshmallow version, I was stoked to try the new crÃ¨me-filled variation.